Meet and transfer from the airport to the hotel. Includes: Breakfast, internet, local phone calls, 24 hour security, 5 tennis courts, semi-Olympic swimming pool, gym, steam bath, jacuzzi and sauna. 7:30 a.m. breakfast and departure for Peña Blanca on the side of Lake Yojoa https://www.google.hn/?gws_rd=cr&ei=gb4-VMf3JsSSgwTM_IKYCw#q=lago+de+yojoa+honduras a beautiful sweet water lake surrounded by high mountains where coffee a large of Cup of Excellence awarded farms are located. Accomodation in the Hotel Las Glorias and transfer to IHCAFE’s training center (“La Fe”). 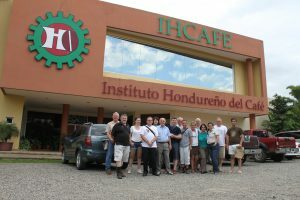 Visit of the Training Center and presentation of IHCAFE. 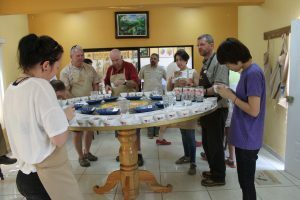 Cupping of coffees provided by coffee exporters. 1:00 p.m. Lunch at the training center and in the afternoon after a short visit the waterfalls of Pulhapanzak https://www.google.hn/?gws_rd=cr&ei=gb4-VMf3JsSSgwTM_IKYCw#q=cataratas+de+pulapanzak visit of “El Cedral” at the time when coffee is being delivered to the wet mill for washing. From El Cielito breathtaking views of the Lake can be enjoyed. One cannot help wonder if such beautiful views “inspire” the coffee trees to bear some of the best coffee beans in the country. 7:30 a.m. Transfer for breakfast to IHCAFE’s training center. 12:30 p.m. Lunch at IHCAFE’s training center. 2:00 p.m. Afternoon visit of “El Cielito” a coffee producing area where many award winning farms of the first places of the Cup of Excellence competition are located. In that area we will visit the farm of Nelson Ramirez that is applying for the Rainforest Alliance certification. Nelson will host the afternoon coffee break. The above video was shot in El Cielito, although not in Nelson’s farm, but it’s the same area of the mountain. Check out and transfer for breakfast to IHCAFE’s training center. 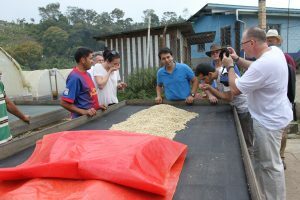 Upon arrival visit the dry mill and dinner at Inaginsa, one of the main local coffee exporters in Western Honduras. Accomodation at Hotel Caxa Real. After breakfast visit and cupping at Coffee Planet’s dry mill. Sandwich lunch and travel to Cocafcal (in Capucas) in the afternoon, visit the wet mill and other installations and dinner at Hotel Las Capucas. Overnight at Capucas, at the Cooperativa Cocafcal which is located in the buffer zone of the Mountain range of Celaque, the largest rain forest reserve in Central America. Breakfast at 7:30 am, and drive to the world famous Ruins of Copan. Breakfast and full day visit of the world famous Ruins of Copan and the Sculpture Museum (light sándwich lunch). That evening cocktails at sunset and dinner at a restaurant to be designated either in town or in a nearby Hacienda. If the restaurant is in town it will give the chance to buy very nice souvenirs. Breakfast and check out at 8:00 am from Copan Ruinas to San Pedro Sula. 11:30 am arrival in San Pedro Sula and registration at the Hotel where the group can have lunch or decide to go for a typical Caribbean style seafood lunch. Visit in the aftenoon of the Quality Center of IHCAFE. Transfer to San Pedro Sula´s airport.